I get to watch all kinds of interesting things on Netflix: Watch Instantly, but right now I’m intrigued by “Hellboy: Animated: Sword of Storms” and “Hellboy: Animated: Blood & Iron.” These 2007 animated kids features add to the already impressive collection of Hellboy materials, which to date include two feature length films (2004 & 2008), a series of comics, trade paperbacks, novels, video games, and even a D&D style RPG. The success of the franchise is a not surprising in light of the success of many comics when brought to the big screen. Hellboy joins adaptations of Superman, Batman, Spiderman, Iron Man, the Punisher, the Fantastic Four, and X-Men, and that doesn’t even get into 300, Sin City, Watchmen, or Wanted. I could go on, but the point I want to make about Hellboy puts it in a different category from most of these other flicks. While I could say that hardly any other series is really concerned with a group of monsters that fight the “supernatural and the occult,” this does sometime seem to be the m.o. of the superpower hero genre. Sure, heroes like Spiderman or Wolverine fight bad-guys with superpowers all the time, but these series often fail to provide a mythology to support their world that relies upon religious manifestations and suppositions. Thus, it is the combination or grouping of the supernatural (which could be take to mean the powers comic book heroes are often blessed with) and the occult together that makes Hellboy different. Instead we see a world that is more like Indiana Jones than Spider man, more like Tomb Raider than Superman, more like Ghostbusters than X-Men. That is, one of the central components of the Hellboy franchise is its reliance on seeing our world as populated with monsters not of science fiction, but of religion. Demons populate this world, not byproducts of nuclear accidents or cosmic radiation. In a given comparison you might find some weaknesses to this distinction, but I’m willing to wager that Hellboy (and Constantine based on the Hellblazer comic books) are one of the few features to deal so explicitly with the occult. The occult is not easy to pin down for in its most general sense it means “knowledge of the hidden.” This may mean things beyond our ability to quantify or measure, or it may mean secret knowledge. In this sense we are confronted with a confusing jumble of terms that sometimes includes not only esoteric and arcane but gnostic. Many conservative Christians encourage general readers to avoid making refined distinctions among such words, choosing instead a path that renders all such things dangerous and forbidden. This is easily seen in many of the criticisms of Harry Potter, where no distinctions are made between real uses of “magic” as a form of religious practice and the magical world seen thanks to special effects studios. I don’t mean to pass judgment on whether or not magic exists. Magic itself is a slippery term that could just as easily refer to turning water into wine as love potions. It’s a dangerous road to walk down as a scholar. I would more readily accept Christian suspicions and denigrations about Constantine or Hellboy than Harry Potter; I know many children who wish that we lived in Harry Potter’s world and that an acceptance letter to Hogwarts will whisk them away from our muggle world, but I don’t know many children who accept that world as the same world we live in. They can distinguish between the human appearance of its characters and their supernatural abilities. In Hellboy humans are simply human, which means that everything else, those “things that bump in the night and which bump back,” could very well be possible. When superheroes populate Metropolitan or Gotham City, we know these are just copies of our world whose shadows are populated with impossible things. Hellboy operates using such shadows, but the basis of its approach is not scientific but religious possibilities. If the Bible is followed literally, then we must conclude that angels and demons both exist. Hellboy seems to accept that proposition and then take it several steps further down the road. Along the way the demons become humanized–speaking our language and taking human form–as well as capable of ethical decisions. This is a natural anthropomorphic step, and I see it as similar to making animals talk. It lessens the gap between fantasy and reality. Bridging that gap, however, is never the primary task of these items. Hellboy’s mythology works without ever filling in all the pieces. 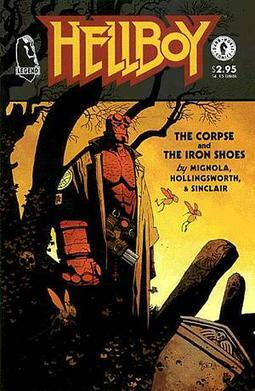 This is the source of the difference between Hellboy and superheroes–the origin story is crucial to superheroes, who cannot exist in a world that is presented as ours without explanation, while the origin story seems secondary to Hellboy, who would exist anyhow but might be trapped on the other side. I don’t mean to imply that Hellboy is somehow more believable than any other product of the SF/F genre, but I do mean to suggest that it is lent extraordinary credibility by preying on a vague and generalized understanding of the “occult” and supernatural. We give such things credence in our daily lives, as least many of us do. What is surprising to me is how unremarkable the presentation of the occult is in Hellboy. It just rolls naturally along without ever really considering its own existence or origins. Constantine wrestles endlessly with the conflict between “his” Catholicism and ours. His demons are torn quite literally from the Scripture, and his methods are drawn from religious folklore. That Hellboy works with unidentifiable sources and with relative immunity from the condescension given to such shows as The Dresden Files or Charmed, suggests that it has successfully populated a niche between those works and mainstream comic fantasies. That niche seems generated not only by renewed New Age visibility of channeling and other such phenomenon, but also by the vivid imaginations of fantasy authors looking to classical myths and religious templates. In the end I think it’s all enjoyable entertainment, but I can understand the dis-ease that many folks have with such flights of fancy. My only problem is that from start to finish Hellboy steals plays from their playbook–and I hate throwing babies out with my bathwater. Recent conversations on Twitter and in the blogosphere (with A. David Lewis and Jeff Bracket) have highlighted the dynamic content available in graphic media for religious studies scholars. A core of secondary literature is emerging, focusing especially on Lewis‘ newly released Graven Images: Religion in Comic Books & Graphic Novels. 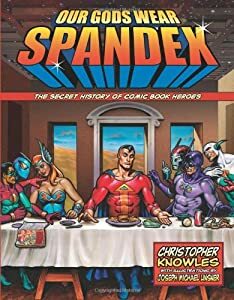 I’ll compile an Amazon recommendation list eventually, but don’t miss out on Jeffrey Kripal‘s Mystics and Mutants: Science Fiction, Superhero Comics, and the Paranormal, Chris Knowles’ Our Gods Wear Spandex, or Greg Garrett’s Holy Superheroes! And be sure to check out Jeff Bracket’s reading list for his “Religion and Popular Culture” course’s 7 week Comic Book unit. Judging by the growing body of literature, we’re increasingly recognizing the secular manifestations of religious themes in popular culture. Comics are especially sharp meditations on what it means to be human. Because superheroes act in the human world, they are always resolving the tensions implicit in their paranormal abilities. In the hero sense, Vincent Morrow, the Witch Doctor, is remarkably frail. He is not cowardly, but he is human. It is his special knowledge of the occult that drives his victories over his supernatural enemies. I’m only two volumes in, and while there appears to be a messianic subplot that may reveal Morrow as uniquely destined to save the world, it doesn’t hinge on superhuman power. In the end, Morrow is a specialist who relies on hired guns for the heavy lifting. If there’s one thing that fascinates me about this series, it’s the invocation of a biology of the supernatural. Straight from Wikipedia, (the horror!) “Biology is a natural science concerned with the study of life and living organisms, including their structure, function, growth, evolution, distribution, and taxonomy.” In this series, the supernatural is positioned taxonomically as another extension of natural life. This both makes it “natural” and gives readers a way to understand Morrow’s approach. It roots and validates the scientific process as well as the supernatural. It is a both-and approach that denies neither side of the enlightenment divide. 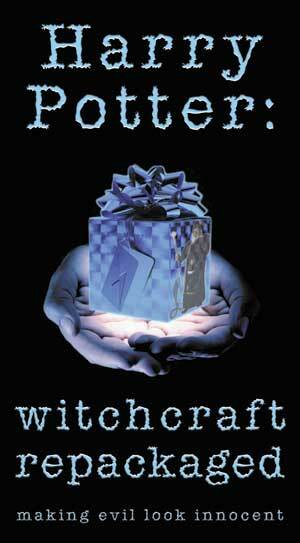 How easy it is to make the mistake of drawing the line between reason and superstition? This series plays right on top of that line, erasing it as it tap dances its way merrily along dealing with demonic possessions with magical steampunkish medical devices. Morrow has a particular appreciation of supernatural taxonomy. In this respect, he plays the role of both naturalist and explorer. He dashes boldly along because it is thrilling to be the first to discover the unknown, to stand where no one has stood before, to see with your eyes what you have never seen before. This is unlike the naturalist, who delights in discovery as an extension of pre-existing knowledge. A new plant? Marvelous! Where does its genus fit on the taxonomical tree? (For more on this distinction see Paul Carter’s newly reprinted The Road to Botany Bay.) Morrow appears thrilled by both sides equally. It’s another tap dance. In conjunction with Hellboy, which I have written about it before, I think we see an important thematic approach to the supernatural: It is not lightly discarded or freely ridiculed; it is accepted. That embrace can appear gnostic–as in Hellboy, which begins with a secret paranormal ritual on the crumbling ruins of a Christian abbey–but the trend is to present the supernatural as normative. After all, Hellboy’s personal journey is one of his desire to be normal. Witch Doctor does this as a medical horror story, but it is the medical and not the horror that makes the supernatural normative. In Hellboy, the Bureau for Paranormal Research and Defense proclaims its members as those who “bump back” against things that go bump in the night. There the horror must be accepted first. The premise is that all of our secret fears are true. 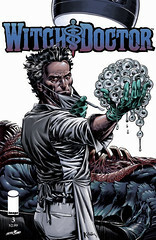 In Witch Doctor, our fears are presented as scientific fact. Overall, I think I’m quite fortunate to be working at a time when the scholarly community is coming to recognize the true vitality of religion in popular culture. I think we’re still in for a rocky road as we continue to battle over what constitute “popular.” At least this means it really is not a battle for legitimacy any longer. It is a battle for effectiveness and representativeness. That’s a turf war, not a rejection of the merits of method or content. Witch Doctor probably doesn’t make the category of what’s popular in a meaningful way. (Perhaps because it is only two years old and printed by an independent comic publisher and not DC or Marvel.) Nevertheless, I offer it as an excellent instance of fictional supernaturalism. Its direct evocation of biology only adds to its intelligent manipulation of religious material(ism). Its playfulness is its strongest feature and very suggestive of the broader range of supernatural elements in comics. When we find that Doctor here means something more like mad scientist and witch means cunning folk, I think we get material that lays right at the heart of the American experience. Inverting these elements–and those of science and the supernatural–is intensely rewarding. It imagines a world that is not divided so arbitrarily as ours has been. (It’s also evidence of the growing rejection of the secularization models that fostered that division, which isn’t to say that the secular world is any more ready to accept the supernatural as fact. It is, however, ready to discuss the ways in which religion continues to permeate the secular world and its cultural products.) Morrow’s world appears to have never had a culture war, never truly separated science and the supernatural. That alone is a premise worth exploring. If you’ve got the time and $10.35, consider giving it a shot. Here’s a juicy cover image to entice you. I’ve been writing quite a bit about religion and film this summer, but I think it is time for a practical post. As folks begin teaching their fall courses with media items, the inevitable challenge is turning the viewing experience into a powerful learning moment. What are the tools necessary for that when we’re dealing with media? We’d all like to assume that students are gifted consumers capable of dissecting and deconstructing critical scenes we examine with them. This is a dangerous assumption because it too easily lulls everyone into avoiding the detail-oriented work of scene analysis. It can be a slog to go through the many elements of a scene. Lighting, camera perspectives, color palette, dialogue, and a half-dozen other cinematic items are all fair game. For a basic walkthrough, you might look at the e-how wiki, which is surprisingly helpful as a starting point. Before you begin, there are a few pedagogical concerns. Where does this film fit into your course’s learning goals? Where does this scene fit into your lesson’s learning goals? How experienced are your students with scene analysis? 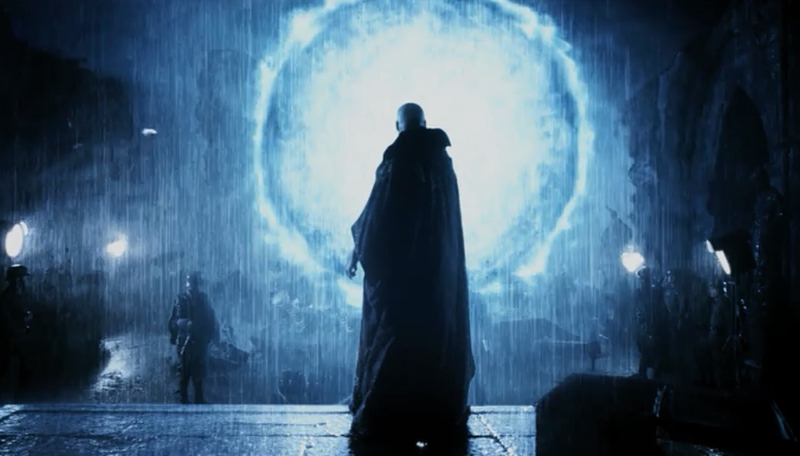 I’m outlining a religion and film course on the Supernatural, and I’m looking for ways to use the opening scene of Guillermo del Toro’s Hellboy (2004). I’m pretty sure that I wouldn’t show the whole film to a class. I worry that there’s too much action and too little explanation of the supernatural elements of the plot to foster significant discussion. 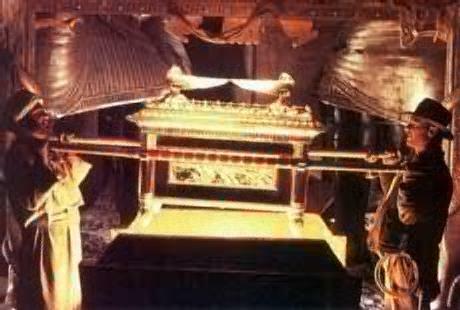 This is a common problem in supernatural action films (even in the cinema classic Raiders of the Lost Ark). By treating the opening sequence as an opportunity to lay significant themes on the table, we can see that Hellboy still has a lot to offer. One of the most significant issues when dealing with the supernatural is the abundance of terms that have competing, overlapping, and contradictory definitions. Des Vermis Mysteriis is a fictional grimorie or spellbook. Invented by Robert Bloch and popularized by H.P. Lovecraft, Des Vermis Mysteriis contains spells that summon horrific, ancient gods from other dimensions. This text, and others like it such as the Necronomicon, are fictional devices designed to give authority to esoteric or occult beliefs. Discuss with students the gradations and differences among occult, esoteric, supernatural, paranormal, and arcane. Brainstorm phenomena and then attempt to categorize and place these items taxonomically. Are ghosts both supernatural and paranormal? Was the ritual that summoned Hellboy paranormal? Occult? Esoteric? Arcane? All of the above? To what are these terms contrasted? What are their antonyms? What does this say about the way we construct natural or human? Why are we debating about these definitions? What about perception, experience, and the consequence of belief? Paul Stoller, “Rationality” in Mark C. Taylor, ed., Critical Terms for Religious Studies (Chicago: University of Chicago Press, 1998), 239-255. Hellboy is chocked full of interesting items for discussion. A scene analysis could go on a long while, so I recommend reserving quite a bit of time for this. Go through the Shots on your own ahead of time. What is shown in each successive moment in this scene? 1) Quotation of Der Vermis Mysteriis; 2) Voice-over while flying through storm clouds to zoom on island; 3) American soldiers getting onto island; 3) “Are you a Catholic? Yes. Among other things.” at foot of Crucifix; 4) Nazis here for the sheep? ; 5) “I grant you immortality”; 6)”What I do here tonight can never be undone.” 7) What’s on the other side of the portal? 8) Americans blow things up; 9) The discovery of Hellboy. How do we know when one scene ends and the next begins? Are there clues for continuity? At 13 minutes or so, I’d be the first to admit this is really several consecutive scenes. There’s a consistency, however, to these pre-credit moments. The color palette–cold blues and muted greens–lies in definite contrast to the post-credit colors. The preferred camera shot for major characters is fairly close-up, giving a persistent sense of intimacy for spoken dialogue. Material religion is rampant with crucifixes, rosaries, hellish bas-relief, sacred tomes, and so on. If you want a full list to work through, I recommend this one. Rather than spend significant time plotting the shots, I’d prepare a detailed list ahead of time. I’d stop after each one to allow students to write down their thoughts. Use the list of scene elements to begin picking apart the scenes. Which characters are being developed? What plot is being advanced? How is the mise-en-scene setting the tone and mood for the action? What is the audience expected to know by the end of this sequence? The key question is always two-fold: what do we know and how do we know it. There are plenty of reasons I think Hellboy works as a starting point for this kind of analysis. It’s long enough to be substantive but short enough to be shown in class. It mixes conventional religious ideas and objects with unconventional fantastical items (rosaries and steampunk gauntlets that open portals to other works). It blends real esoteric religious knowledge (ley lines) with fictional concepts (Des Vermis Mysterii). It acknowledges history (there was Nazi interest in the occult) but mythologizes that history (it was working but the Americans stopped them)! Above all, this is a strong cinematic opening. It requires no pre-knowledge or preparation. Most of the audience wouldn’t know the first thing about the Cthulhu mythos. Nor would they have read Mike Mignola‘s excellent comic series (upon which the film was based). While they may have heard of Nazi occultism, Rasputin, the paranormal, demons, ley lines, and hell, each of these concepts is framed internally to the sequences here. Part of getting comfortable talking about the supernatural is finding where the seams of knowledge are most frayed. Look here in the future for more items as I continue to sketch the components of this course. I expect that Constantine (2005), Cabin in the Woods (2012), Drag Me to Hell (2009), and The Exorcist (1973) are all excellent candidates for inclusion. I’ll eventually turn to the softer side of things, too. That may be the moment to include Ghost (1990) or Spirited Away (2001). If you’ve got suggestions, I’m all ears.